of novel features and optional software control. 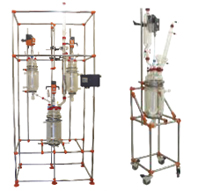 These lab reactors range offer, systems ready to use or customized which can have single or vacuum jacketed vessels with a specific geometry from 100ml up to 50L and a temperature range : -70 ° C up to 230 ° C.
They can be automated at any time allowing users to log and control multiple devices and sensors. reaction systems and frameworks Traditional reactor kits with floor or bench standing frameworks Innovative, reactor work station. Rapid vessel exchange. Innovative, two vessel reactor work station. Rapid vessel exchange. Innovative pilot scale reactor work station. Rapid vessel exchange.